Learn how to brew kombucha with Green Lab and take away your very own SCOBY and starter liquid to kickstart your first batch at home. Kombucha is raw fermented tea. The sugar-tea solution is fermented by bacteria and yeast commonly known as a ‘SCOBY’ (symbiotic colony of bacteria and yeast). Although its usually made with black tea, kombucha can also be made with many other types of tea or even coffee. These ingredients are left to ferment in a warm environment for a period of time, leaving you with a delicious, refreshing and nutrient dense drink. Green Lab has been brewing its own kombucha for the 6 months and we’re keen to share how simple and straight forward it can be to ferment your own strain of the tea, and get creative with flavouring. The workshop will run for 2 hours, including a tasting session, your own SCOBY to take home and a set of guidelines for brewing and experimenting with more teas. No experience needed, you will be taught all the basics. You will have a kombucha tasting session and learn the process of brewing your own kombucha, with a demonstration of the Green Lab brewed batch, you will also be given a SCOBY and starter liquid so that you can brew your own kombucha at home. 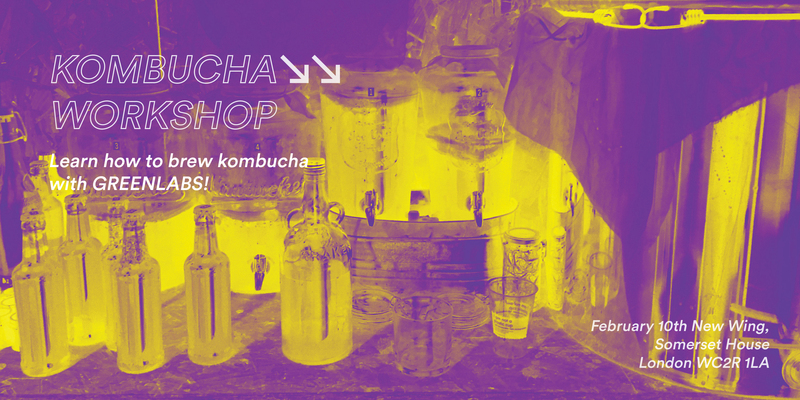 Jon Katona, Green Lab’s kombucha specialist will be teaching the workshop.